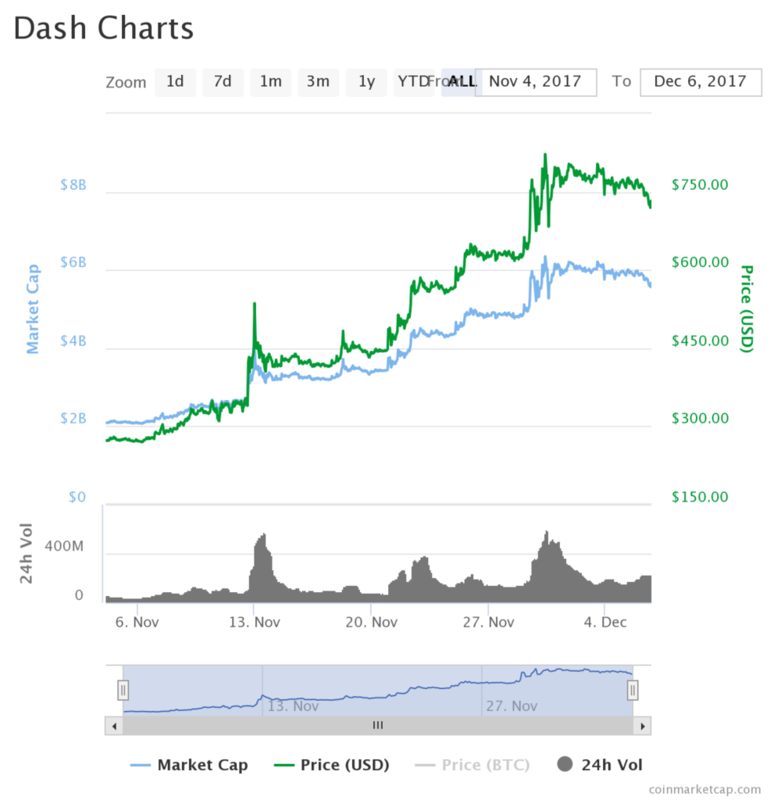 Since March and Until November, Dash has seen a price increase that is in line with the cryptocurrency market in general. But the last month, Dash has skyrocketed. Its price passed from $272 dollars on November the 6th and reached $814 dollars the 30th. After that day, Dash price has stabilized between $720 and $800 dollars. What is the Reason Behind This Recent Price Surge? We can’t say that Dash has been under a speculative attack, or that speculative capital is the only factor that pushed Dash price up. There are many different reasons that let us suppose that this increase on its price is linked to what Dash team achieved this year. We have two important elements to analyse: Dash Integration with different platforms and network developments. During this year, Dash was working in order to integrate with different platforms. Dash is now supported by various cryptocurrency debit cards. Visa offers a debit card that allow users to spend their Dash in different retailers who accept Visa. Moreover, Dash has been added to several exchange platforms. That allowed users from all over the world to acquire Dash via their preferred exchange. Among these important cryptocurrency exchanges that accept Dash we can find Bitthumb, Bitfinex and Kraken. On December the 5th, Dash and Uphold announced that the virtual currency was going to be integrated into Uphold’s platform. Uphold is an important exchange that allows users from more than 184 countries to buy different currencies. Many cryptocurrencies in the market, like Bitcoin for example, have deep debates about how to scale the currency network. This has led to the Bitcoin Cash hard fork and the cancelled SegWit2x fork. At the moment, Bitcoin developers are working with off-chain solutions to scale the network in an efficient way. Dash didn’t want to be one currency with scaling problems. At the moment Dash offers fast transactions at a low cost. So as to scale the network, Dash team has decided to offer an on-chain solution increasing the block size. Now that Dash offers 2 MB bocks, the network is able to process twice the number of transactions per second. Furthermore, Dash team will increase again the block size to 5 MB.